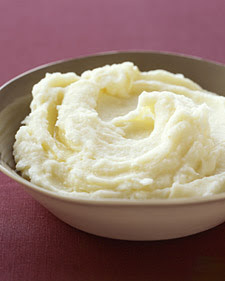 I have some easy side dish recipes, for Thanksgiving. I don't know about the rest of you, but for me, it's one of the busiest days of the year. 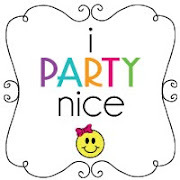 So anything that is easy, is more than welcomed. 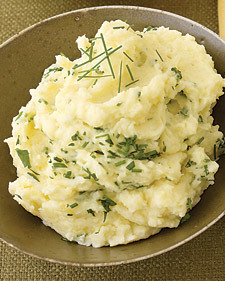 My favorite sides are mash potatoes and stuffing. The most fattening sides, I know! But I just love em'. Hope this can help. 1. Peel potatoes and quarter lengthwise; cut crosswise 1/2 inch thick. In a 5-quart saucepan, combine potatoes and garlic cloves; cover with water (about 8 cups) by 1 inch. Add 1 tablespoon salt. 2. Bring to a boil; reduce heat, and simmer until potatoes are easily pierced with the tip of a paring knife, 25 to 30 minutes. 3. Drain; return garlic and potatoes to pan. Stir over medium-high heat until dry, 1 to 2 minutes. Remove from heat. 4. In a small saucepan, bring milk to a boil; pour over potatoes. Add butter and 1 teaspoon of salt. Mash until smooth and creamy. 1. Place potatoes in a large pot; cover with cold water by 1 inch, and add 1 teaspoon salt. Bring to a boil; reduce heat to medium-low, and simmer until potatoes are tender, 15 to 18 minutes. Drain; return potatoes to pot. 2. Stir potatoes over medium heat until dry (a film of starch will form on bottom of pot), about 1 minute. Remove from heat. 3. In a small saucepan, combine half-and-half and butter; bring to a simmer over medium heat. Pour half of hot liquid over potatoes. Mash just until smooth, adding more liquid to reach desired consistency. Stir in parsley and chives; season with salt. Garnish with more herbs. 1. Preheat oven to 400 degrees. Arrange bread in a single layer on two rimmed baking sheets. Bake until crisp but not browned, about 10 minutes, rotating sheets halfway through. 2. In a large saucepan, melt butter over medium heat. Add celery, shallots, and garlic; season with salt and pepper. Cook, stirring occasionally, until vegetables are softened, 5 to 7 minutes. Add wine, and cook until evaporated, 3 to 5 minutes. Transfer to a large bowl. 3. To vegetables in bowl, add bread, parsley, and eggs. Season with 1 1/2 teaspoons salt and 1/4 teaspoon pepper; stir to combine. Mix in half of broth. Continue to add in more broth just until stuffing is moistened but not wet (there should not be any liquid in the bottom of the bowl). 4. 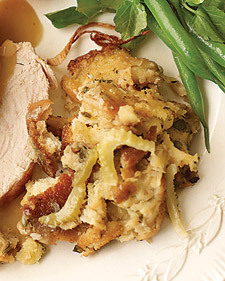 Just before roasting turkey, stuff it with 4 cups stuffing. 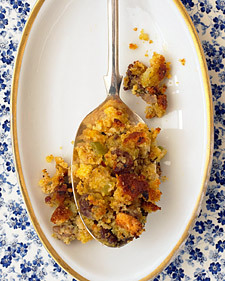 Spoon remaining stuffing into a buttered 8-inch square baking dish. Cover with buttered aluminum foil, and refrigerate. When turkey is removed from oven to rest, place covered baking dish in oven, and bake until warmed through, 25 to 30 minutes. Uncover and bake until golden, about 15 minutes more. 1. Preheat oven to 350 degrees. In a large nonstick skillet, cook sausage (and giblets, if using) over medium-high heat, stirring often, until browned and cooked through, 5 to 8 minutes. With a slotted spoon, transfer to a large bowl. 2. To pan, add onion, celery, and 1/4 cup water. Reduce heat to medium; cook, scraping up browned bits with a wooden spoon, until vegetables soften, about 10 minutes. Season generously with salt and pepper. Add to sausage.